There are new forms of in-car technology being developed all of the time, and you will find that the Entune technology that is available is smart. This type of technology can help you stay connected at all times, no matter where you are going. When you take advantage of Entune technology in your Toyota vehicle, you can use this technology to help you get your phone connected to that vehicle. You can use this technology to access content from your phone through the screen that is part of your vehicle. The 2019 Toyota Tacoma is an agile and capable mid size pickup truck. 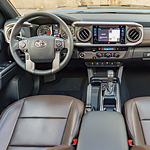 While the 2019 Tacoma is certainly designed to perform well in a wide variety of outdoor environments, it also includes many highly sensitive driver assistance and safety technologies. 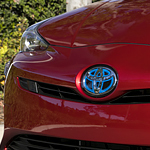 These technologies include Toyota specialties such as auto high beams as well as radar directed cruise control. There seems to be endless makes and models of vehicles available on the market right now. Depending on what your budget is, you might be having a hard time figuring out what you would like to purchase. 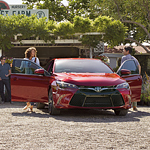 If you are looking for a more high-end vehicle but with an affordable price tag, stop down to our Chicago Northside Toyota location and shop our inventory of certified pre-owned Toyota vehicles. The certified pre-owned accreditation is something that wasn't always around. That's largely why pre-owned vehicles have had a bad reputation. The Toyota Corolla is one of America's favorite sedans, and has been for decades. 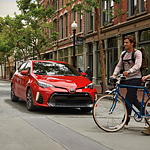 The Corolla is known for its reliability and efficiency. The new Corolla is also known for its great aesthetics. Today's Toyota Corolla is sleek, dynamic and shiny. This is a car that really gets attention. The Corolla's grille has been redesigned. It's low to the ground. There are two versions available. One has traditional horizontal bars. The other has a honeycombed appearance. The headlamps for the Toyota Corolla have been remade, too. The new Bi-LED lights are smaller, yet brighter. ​When you’re in the market for a new vehicle, safety features should be a big part of your decision. However, if you’re unfamiliar with the difference between active vs. passive safety features, knowing where to start can be difficult and frustrating! Our friends and neighbors in Evanston and Chicago should be glad to learn that the distinction isn’t all that complex. The big difference: active safety features are designed to prevent accidents and improve your control, while passive safety features only really function as an accident is occurring, or when one has just occurred. Many drivers consider the vehicle they drive an extension of their own personalities. 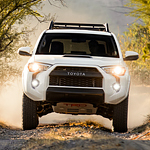 If your personality can be classified as the wild and adventurous type, our sales personnel at Chicago Northside Toyota invite you to consider upgrading from your current vehicle into a Toyota 4Runner, featuring body-on-frame construction to ensure durability and ruggedness. A lot of design thought went into the exterior features of the Toyota 4Runner to make it a vehicle that is one of the most popular mid-size SUVs in the marketplace and a vehicle that sets it apart from the competition. 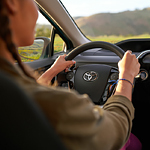 Toyota now takes an additional step to help increase the safety of people driving its vehicles. The company established a 24/7 subscription service for cars made after 2009. The service can assist drivers in many ways if trouble arises. The "Roadside Assistance Feature" should prove helpful in instances where a vehicle suffers from an unexpected mishap. Flat tires, dead batteries, and running out of gas present troubling problems for a driver. In some instances, safety might be compromised. Through access to a roadside assistance response, troubles may hopefully be resolved. The Toyota Yaris is a vehicle that is exceptionally well rounded. Not only do you get a stylish exterior and a comfortable interior, but you also get plenty of technology features throughout your vehicle. Some features are designed to keep you comfortable. This includes features like a touchscreen infotainment system that is 7 inches in size. You can control your navigation, audio and other features from here. Three free months of Sirius XM radio are included as well.